Chase Bliss Audio have just revealed the new incarnation of their flagship Warped Vinyl chorus/vibrato pedal. The Warped Vinyl HiFi dishes up everything from lush shimmering chorus to detuned vinyl sounds and everything in-between. Detuned vinyl sounds, subtle chorus and everything in between – the Warped Vinyl HiFi from Chase Bliss Audio is the ticket to endless modulation effects. As with all Chase Bliss pedals the new stompbox features an all-analog signal path, but that is digitally controlled, giving users unprecedented control over presets, tap tempo, and a slew of other functions. This is the third iteration of Warped Vinyl. Some of the new features include a lag control, reduced noise and a new tone control for dialling in extra brightness (hence the name). A simple chorus pedal it ain’t. 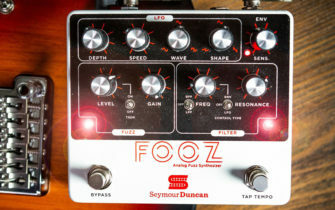 Of course it can be used that way, but the degree of control that it offers definitely places the Warped Vinyl HiFi right at the highest end of effects pedals, and would be worth exploring as a piece of outboard processing in its own right. Find out more on the Chase Bliss Audio website.